I’ve been a military spouse for the past 16 years and lived in various locations across Canada. Most of my family lives in Ontario so I’ve spent the majority of my adult life living far away. I used to only stay connected via phone calls, but technology has opened up a new avenue of possibilities. 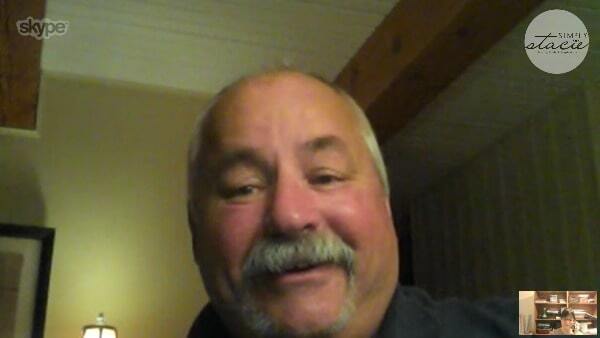 I can still chat on the phone with my mom, dad and sisters, but we’ve also discovered the wonderful world of Skype! Funny story….when I was young I used to imagine an invention where you could talk to someone and actually see the person you were chatting with. Back in the 80s, this idea seemed very futuristic and it’s neat to see that it’s actually a means of communication now. Technology is such a cool thing. My 8 year old self is still in awe with how far communication has advanced. 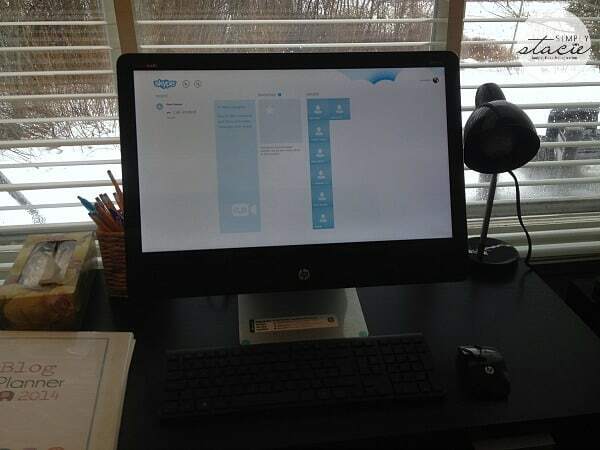 HP Canada provided me with an ENVY Recline 23 TouchSmart All-in-One before Christmas and it’s been a true blessing. Not only did I create gorgeous Christmas cards and decorations, but I also was able to see and talk to my family in Ontario over the holiday season. My parents own the HP ENVY X2 PC and both of them have been really enjoying our chats. Seeing and hearing them makes me feel closer despite the distance. It was wonderful to see their faces Christmas morning and wish them a “Merry Christmas”. They told me no pictures though since they were still in their pyjamas. I guess I understand that! 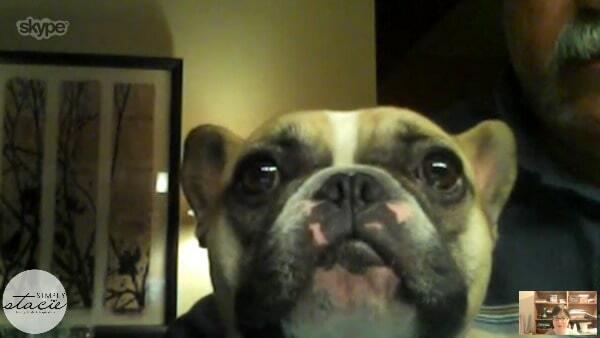 On another call, I was able to virtually meet my sister’s new French bulldog, Charlie. He is so cute! I just wanted to reach through the screen and kiss his little face. He sat nicely on my dad’s lap and looked right at the screen. He could see and hear me calling his name. The ENVY Recline 23 TouchSmart All-in-One has a HP TrueVision HD Webcam and a 23-inch diagonal Full HD touchscreen. It’s the next best thing to being there in person. The picture was clear and sharp. Of course, my parent’s dog, Maude, wanted to say hi too. She was jealous Charlie was getting all the attention! We were also able to grab a quick picture of the two of them together on my dad’s lap. They are so adorable and have become good friends. In addition to the incredible visual experience on the ENVY Recline 23 TouchSmart All-in-One, there’s also the top notch audio experience. The PC is fully equipped Beats Audio™, dual speakers and a subwoofer. Voices come through crystal clear with zero muffling or feedback. I could close my eyes and it would seem like my dad was sitting right beside me. My dad loves to crack jokes and make people laugh. Of course, he had to tease me and tell me a funny story. I really miss him! He started making funny faces too. He’s almost 60, but still a kid at heart. I really enjoy our chats and how the ENVY Recline 23 TouchSmart All-in-One allows me to stay connected with my loved ones from far away. I can see them smile on the large 23-inch HD touchscreen and hear their laughter like they are right there with me. Plus, the ENVY Recline 23 TouchSmart All-in-One has an adjustable all-in-one touchscreen where you can change the viewing angle to whatever your preference. Staying connected is so important especially when you are at a great distance. 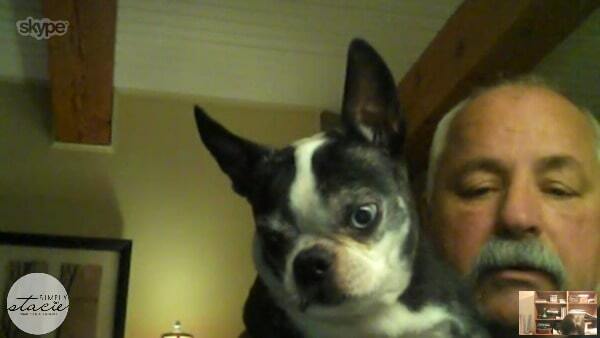 I look forward to more skype chats with my mom and dad. My dad will be working on some new jokes to tell I’m sure! Learn more about the ENVY Recline 23 TouchSmart All-in-One. Watch for upcoming post where I’ll be sharing another way I’m using the ENVY Recline 23 TouchSmart All-in-One: Adobe Photoshop Elements 12! HP and Adobe products mentioned in this post were supplied by HP Canada and Adobe Canada. I know how important your family is to you Stacie and what a fabulous way to keep in contact! I LOVE Charlie’s screen time especially..hehe The Envy is obviously a fabulous choice and one anyone would love! Great photos and post Stacie! Family is very important to me and all of ours. With us living in NB and my sisters family in Alberta, we are strong Skype users. Recently we have spoke about creating a Google+ hangout and taking a night every couple of weeks to join together and just chat. I love Skype, I’ve had it for years and it has improved considerably over time. 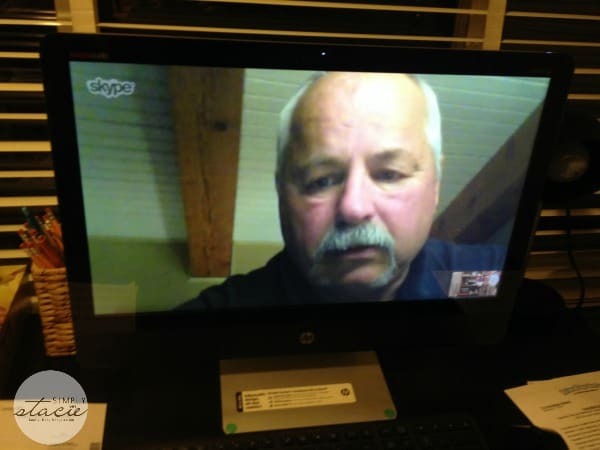 I often skype with my brother and a cousin in England and with my children who are scattered throughout the world, England, Germany, Australia and here in Canada too. It’s marvellous to be able to see and speak to my grandchildren and children all at the same time. Another good addition to have is What’s app for mobile phones. Another great way to communicate. 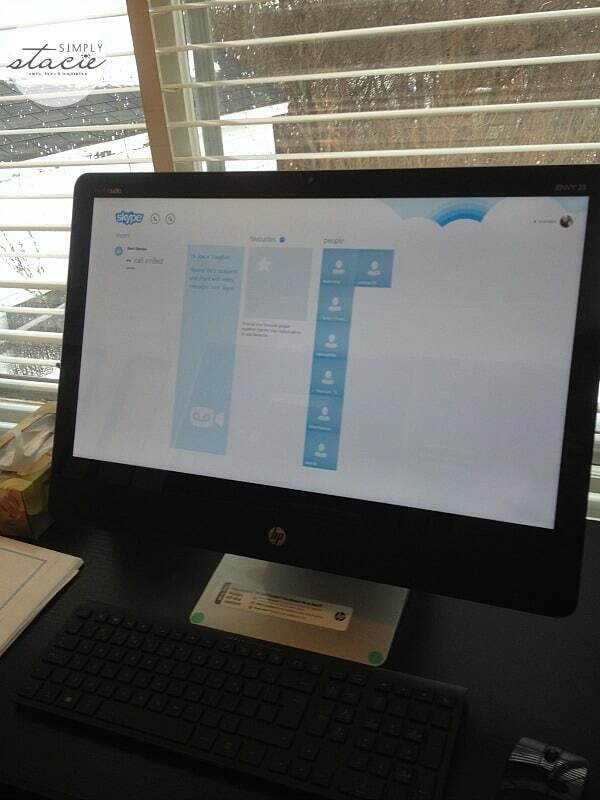 Skype is amazing – as is how far technology has come and where it will go. I know about Skype, but have never used it. Most of my friends and family are in the area so I get to spend time with them here. We should use Skype more, thanks! OH I’d like to have one of those! It looks like great fun! Skype is a wonderful tool for keeping people connected. My kids love talking to Grandma “on tv” :)! Your dad is great! I’m smiling from here. What a treasure seeing him and the dogs must be! Technology has come far, and I’m glad. 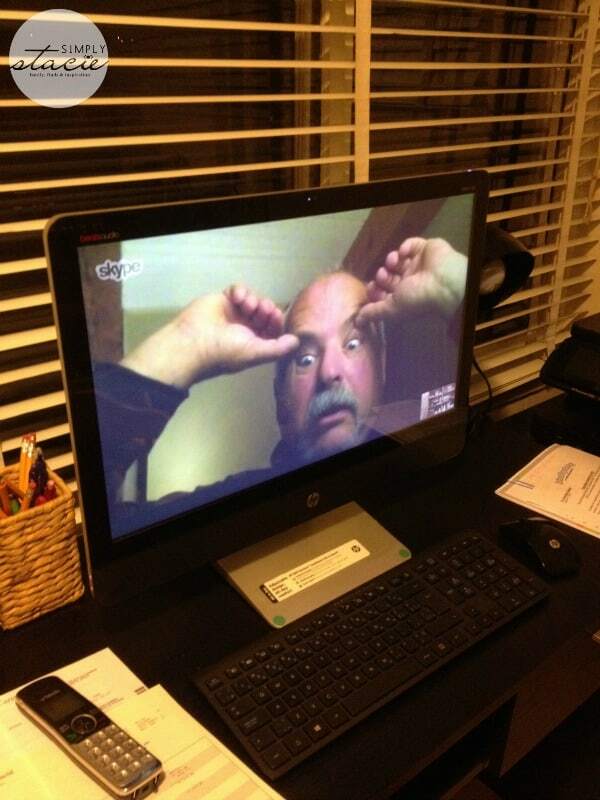 My grandkids live far away, and Christmas morning we were Skyping to see them. It was great seeing them with their presents and excitement. Skype is a wonderful way to keep in contact and see the new things. My grandkids can show me their art work or gifts. What a great way to bleep in touch. Cute dogs! The ENVY Recline 23 TouchSmart All-in-One looks like a great unit. I love how technology now a days allows us to keep in contact with family easier, it is one thing to talk to them on the phone but seeing them while you talk is even better! I have friends and family all over Canada, so I’m embracing all the new technology to help me connect with everyone ! lol That is really cute!! 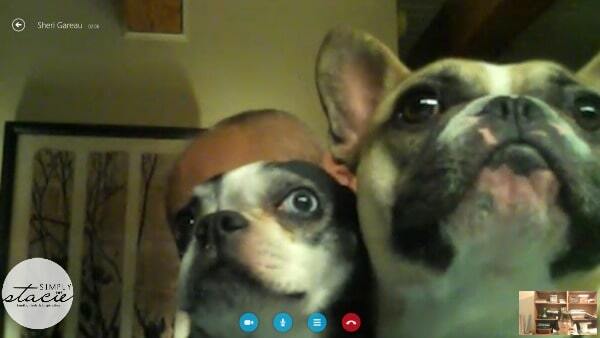 I Skype with my family back home as well. They all live in Ontario and Quebec and us in Alberta. I love Skype and don’t know what we would do without it. My family wouldn’t get to see my kids change and grow! This is great – thanks for the fun post, with photos! Family is indeed so important. Too funny ! Skype is a great way to keep in touch ! I know how hard it can be to live away from family. Although my parents only live 3.5 hours away, it can be hard to see them as often I’d like. I have tried to get my mom into Skype, but she prefers the phone. Maybe one day I will be able to get her into it! It really is amazing how far we have come in such a short time. We have used Skype quite a bit but now find that the proliferation of Apple products makes FaceTime way more convenient for our family! The kids now have it on their Ipods so can keep in touch with the parents and their iphones Love the keeping in touch with the dogs though! Totally cute! Skype is awesome. It’s so cute how the animals are involved. These pictures look crystal clear. I’m very impressed with this system! I’ve recently moved to the mountains and I’m about 2hrs away from my Family, which has cut down on our visits quite a bit. I’ve been looking for something like this so I can stay in contact with my Grandchildren and watch them grow. Skype is such a lifesaver! I no longer have huge long distance phone bills and I get to actually see my little nephew! 🙂 (He talks to my cats too) The Envy looks like a great choice! I love the doggy pictures! So cute, its awesome that you can connect with your family who are far away. 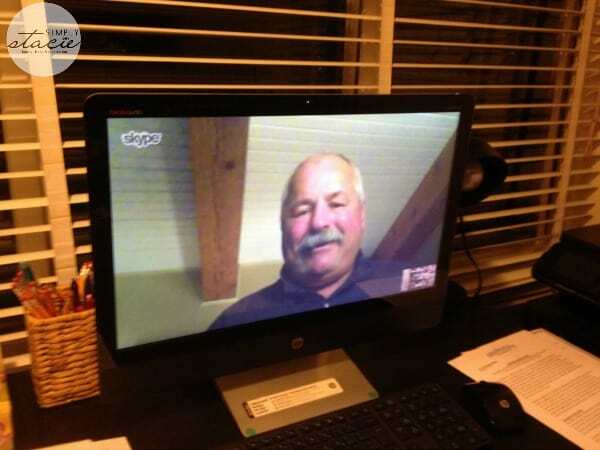 That’s so neat that you got to Skype with your dad. It’s so easy to stay connected through technology these days. This looks like a really great computer, I would love to have one of these. 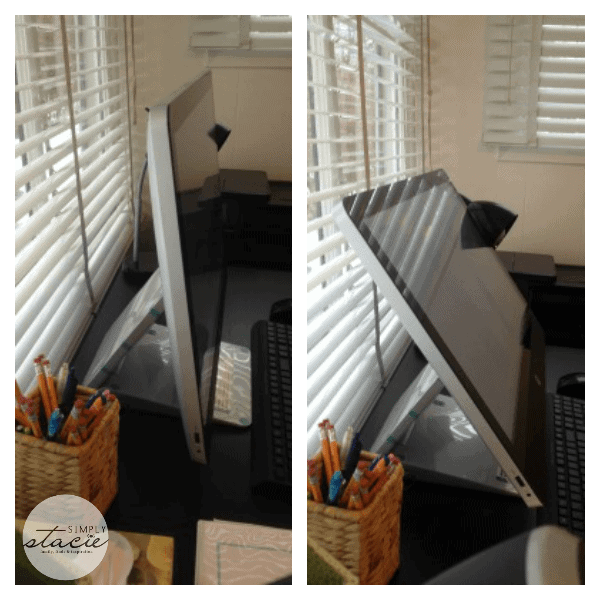 Thank you for this post, and I look forward to future ENVY Recline 23 TouchSmart All-in-One posts. Wow that is so convenient. It’s amazing how far technology has come! It’s so important to keep in touch with family and friends! i am a military brat (but an old one 39 yrs old :), but i graduated in germany in 92….i can’t imagine how wonderful it would have been to have skype, cell phones….etc. my friends would move back to the states and it was SO expensive to talk on the phone, it rarely happened! i’m glad technology has made it so easy for families to connect! So adorable! What a great way to connect. That is so sleek looking! Love your post, make me grin from ear to ear!! My (now) husband and I met online (in a Sims forum) going on 12 years ago. He was from England and I lived in the states. After a year of yahoo chats and web cam, he came for a 3 month visit and we were engaged before he left .. it took us anothe 2.5 years to be financially able to get him back here and for us to be married. We didn’t have the nifty kind of set up as you with all the new-fangled bells and whistles, but I honestly feel the technology of the web cam and chatting is what made those 2.5 years bareable for us. Being able to talk, see each other and stay in touch daily is what brought us together and kept us together while we waited to be together again. Since we’ve been married, he has used the same technology to stay in touch with his family back in England and Wales on a weekly basis. My 8 year old self would think we’re now living in an unbelievable Jetson’s futuristic era and I’m totally in awe of it all! Love the pictures of your dad and the dogs.